Since 2011, Rex has been a regular DJ fixture on the New York City based Internet radio station Radio InfoWeb, that broadcasts free-form progressive rock centered radio with an ecclectic mix of psychedelic and heady other. 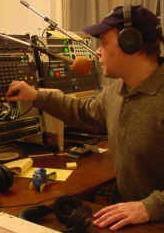 He can be heard live or on recording at all times of day, along with about five other regular DJs on the station. A child of Day Page (below), this program is broadcast live on Radio InfoWeb from 7-9am NY time weekdays, occasionally starting as early as 6am depending. The first season ended 6/6/2014 after about 25 episodes. Since the fall of 2016, the program mutated into a mashup of music and news items from a non-profit news source. Unfortunately, that news source became unhinged journalistically at about the same time due to the election that year. The news content has been slated to move to another stream, but budgetary shortfall has prevented it so far. The Fun Raiser to make that possible is at patreon.com. Rex hosted "Day Page", a daily capsule of the morning's news that was produced from approximately Match of 2013 through early 2014. Production has been suspended, but may be resumed sometime in the future. Recorded before 6am weekdays in Studio 1A at InfoWeb Broadcast Center in New York city. The program was also broadcast on the Liberty Radio Network, with outlets on satellite, terrestrial broadcast, pirate radio, and the web. For more information, visit DayPage.net. You can hear all the DayPages since before the beginning in the DayPage Archives. Rex Latchford is author of the forthcoming full length novel "Monsters from Pluto Drink Our Blood". The planned for release in Paperback has been delayed, and a new date will be posted here when it becomes available. I don't live on Earth, and don't read English, but if I did, this would probably be the first book I would read. Rex graduated from Arkham University where he studied and, briefly, taught English Literature. Rex has been rather put-off by the shenanighans of questionable legality by the NSA, and is has had a distinct chilling effect on his writing. Thus, the content in the links below is mostly older. Rex likes to "Keep Them Honest" on the Latchford Factor blog. Visit RexWrite where Rex... well... writes. See also The Rex Review which reviews stuff. You can find Rex on Facebook. Rex Latchford: One of the rare reoccurring NPCs from Call of Cthulhu. He was a professor at Arkam University and author, who used his investigation into the Mythos to write cheap pulp novels for the masses. Some of his books were: "Beware of the Bed", "The Blood Beast Terror", "The Snow Runs Red with Human Blood! ", "Monsters From Pluto Drink Our Blood", and "We're All DOOMED!". He was driven insane several times, and wandered around openly wearing several large caliber pistols. He was last seen fleeing from his house in Arkham, after a fatal shoot out with the police, in the company of "The Boston Butcher" John Enslinger, and Joseph "Shotgun" Decker.